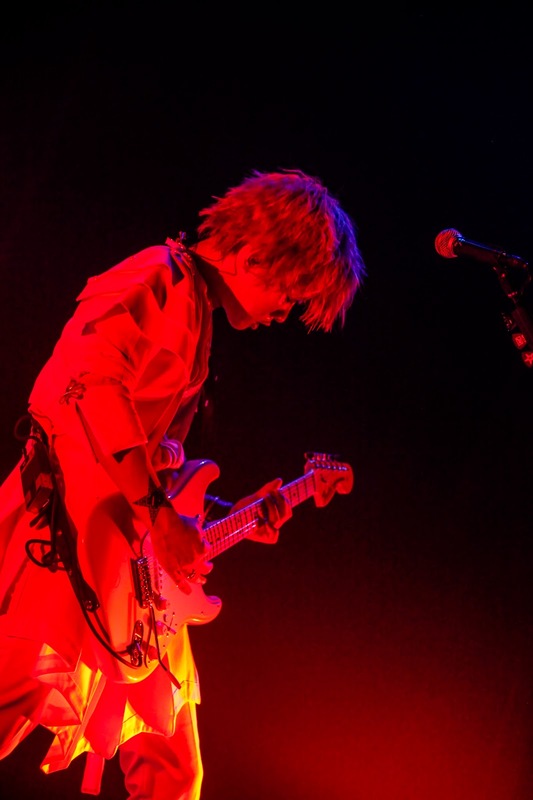 LIVE REPORT: A9 "Re:birth -飛翔-" @ Toyosu Pit 8/23/2015 | VKH Press – J-Rock & Visual Kei Coverage Worldwide! 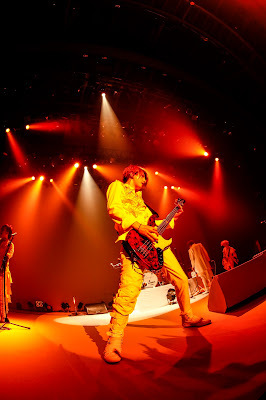 When you think A9, you think energy, and nothing could have been more energetic than their comeback live "Re:birth -飛翔-," at Toyosu Pit this past Sunday. I had opportunity to go see this momentous occasion for myself, and was not disappointed. Their first full concert in a year was filled with a lot of surprises, and a lot of emotions. Despite looming dark clouds in the distance, the atmosphere at Toyosu Pit could only be described as sunny. A9 fans, referred to as NUMBER SIXES, from all over the world had gathered at the live house to celebrate the band's comeback from a year away. While they made an appearance earlier this month at V-NATION, this concert marked their official return and their 11th anniversary, a true "rebirth." Vocalist Show stated during an MC that their 10th anniversary live (at Fuji-Q Conifer Forest) seemed like it just happened, yet also felt like it took place ages ago. Shouting, "Now I can say what I've wanted to say for so long... We're back!" he bowed deeply as the fans replied with "Welcome home!" And throughout the concert you could definitely tell they were at home. Doors opened a little after 4PM and the fans filled the over 3000-person capacity venue within minutes. 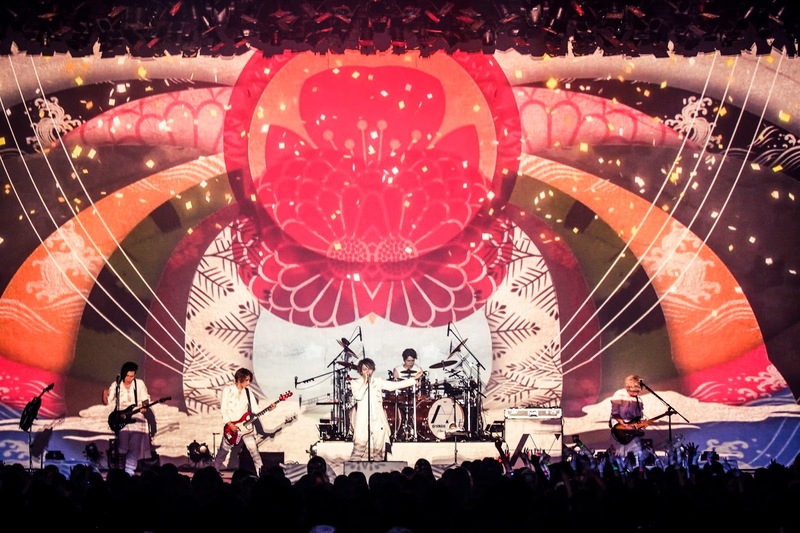 When the lights went down inside, the beginning of their song "PRAY" from their crowd-funded EP, Ginga no Oto, started to play and the audience gasped in excitement as each member's silhouette appeared behind a screen surrounded by colored spotlights. Within mere seconds of the ending of "PRAY," the screen dropped to reveal the band all dressed in white, and jamming out to "Phoenix" (released on YouTube March 1st), complete with the image mapping from the PV. The crowd immediately went wild and didn't stop until the end of the night; neither did A9! 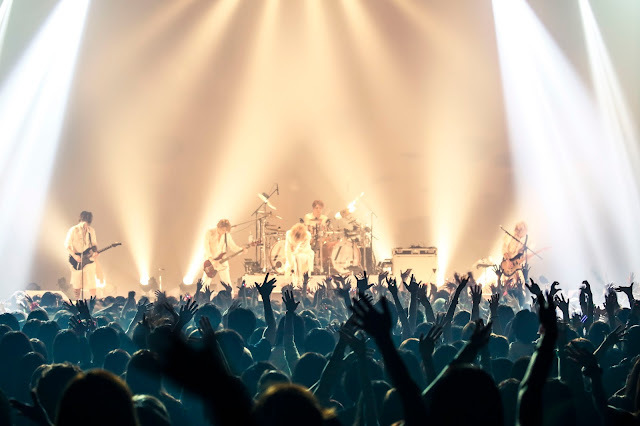 Playing a wide range of classics and fan favorites, including "RUMWOLF," "Daybreak," and "Hyakka Ryouran," the band seemed genuinely happy to be back onstage performing for all of their fans. Guitarist Tora's limitless energy was evident throughout the live, especially on songs such as "Yami ni chiru Sakura" and "RAINBOWS." The sound inside Toyosu Pit is very rich, and complimented the band perfectly. Bassist Saga gave some real standout performances on songs such as "Scarlet" and "Spiegel." 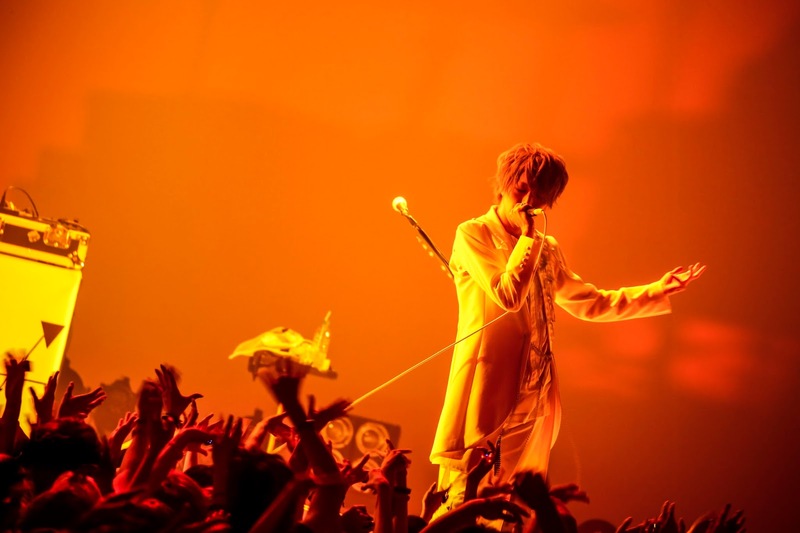 His solo during the fan-favorite "Haikara naru Rondo" made the crowd go wild. Speaking of solos, each band member had one, and quite unique ones at that. Show deejayed for the fans and really got them moving with some EDM (electronic dance music); Tora busted out some heavy metal riffs as his name flashed on the screen behind him, and guitarist Hiroto let his guitar do the talking as the music enveloped everyone inside the venue with warmth. The rhythm section wowed everyone with a drum off; Saga surprised us all with his drumming, standing behind a snare and a floor tom and playing alongside Nao at his drum kit. 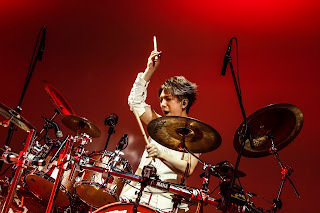 Saga later broke out his bass again while Nao continued drumming, tossing and twirling his drumsticks in the air effortlessly. Everyone could tell that they were having the time of their life! 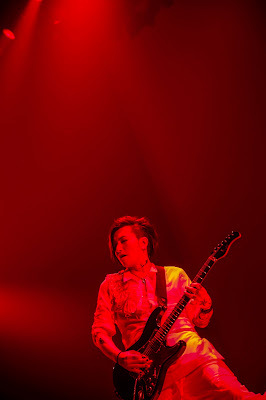 Between solos, the band played "Freesia no saku basho," a song that got its start last year while the band was on tour in Asia. Many in the crowd were moved to tears to hear the full version live, something that happened throughout the night. During "Ryuuseigun," Show raised a towel and swung it around, and within another verse the entire audience had their own towels up in the air twirling in unison. "Thank you all so much for coming," Show said later during the concert, "We are so very happy. Remember at Conifer when we continuously said we would never break up, and to please wait for us? If you didn't wait for us, we couldn't do this. We couldn't do this without you, without the five of us. I love them all... You are where we are supposed to be. You are our 'place.'" With that, the band dove into "RAINBOWS," and didn't stop rocking out until "Kaisen Zenya." During these songs Hiroto played his guitar behind his head and Show sang until it seemed he could sing no more, and then continued. 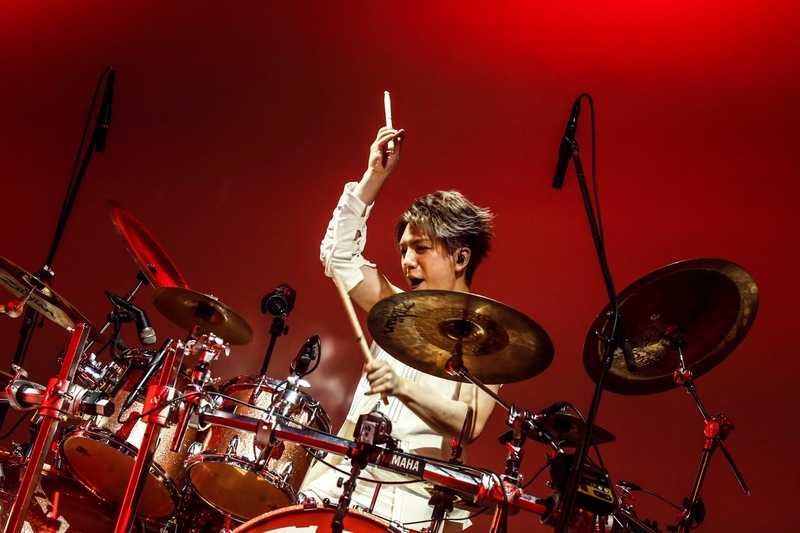 As they finished the set, Show once again thanked everyone in the audience for coming together for them, while Nao threw his drumsticks into the crowd. The second the band left the stage, the fans started chanting for an encore; nobody wanted the night to end. A9 came back out a few short minutes later, having changed into shirts being sold at the event. "Thank you for wanting an encore," said Show, all smiles. They performed "Heart of Gold" first, the audience singing part of the chorus. As the song ended, Show waved at the crowd, them waving back. Once again, he thanked everyone for coming to the live. "Because of each and every one of you, we've been able to come this far. Although we've caused you all to worry at times, we thank you. Please continue to go along with us." He then asked the crowd to sing along with him to the final song of the night, "Subete e."
As the opening lyrics were displayed onscreen behind them, the band played with just as much energy as they had at the beginning of the concert. Streamers burst from the ceiling, fans sang, danced, and cried. As the song ended, it was easy to see that not just the fans were overcome with emotion as Show paused a moment to cover his face. Tora got down on his knees and made a gesture of gratitude towards the crowd. They all thanked the audience once more, waving and throwing more guitar picks and drumsticks into the audience as they left. Hiroto was last to leave, stopping in the middle of the stage and holding his arms out and then wrapping them around himself as if embracing the entire audience, and bowed. Even after the band left, the fans continued to shout for another encore until the lights in the venue came on and announcements were made over the PA system. While this concert was officially over, like a Phoenix rising from the ashes, A9's new journey is just beginning, and they're ready to soar. A9 embarks on their fall tour "Re:birth -天翔-" starting September 3rd. More information and tickets can be found here. Special thanks to A9 for making this review possible!